Starcraft certainly isn't the “last standing” manufacturer in the RV industry, but for sure the company can claim its “pole” position as one of the first. Indeed this family-owned business has been around since 1903. They entered RV business in 1964 revolutionizing the designs of pop-up tent campers. And today, with its series of AR-One travel trailers (as well fifth wheels) it has well deserved place among RV manufacturers. The AR-One series for 2017 includes nine models starting with the smallest one in the family – 14RB (exterior length 16’6”) and ending on the luxurious side with 19RT (exterior length 23’6”). 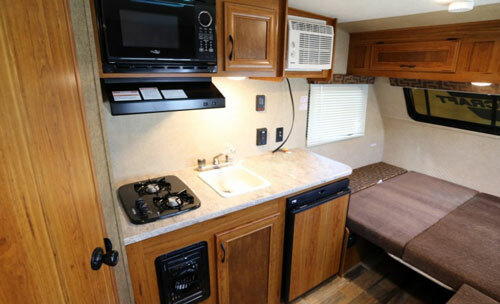 The model 14RB belongs to the popular class of small travel trailers that can be pulled by most SUVs and minivans, but still providing a lot of amenities that till recently were only part of higher-end campers. Looking at the floor-plan we can find all-familiar “blocks” of a home-away-from-home” – kitchen, dinette converting to bed, wet-bath including toilet and shower, sofa providing comfortable seating place and a lot of cabinetry including a closet. The kitchen is equipped with 2-burner stove, power range hood, sink w/high faucet, microwave oven w/carousel, 3 cu ft. gas/electric fridge and plenty of counter-top space. So the preparation of any meal is not anymore a “scout-like” experience but rather familiar “home-like” one. 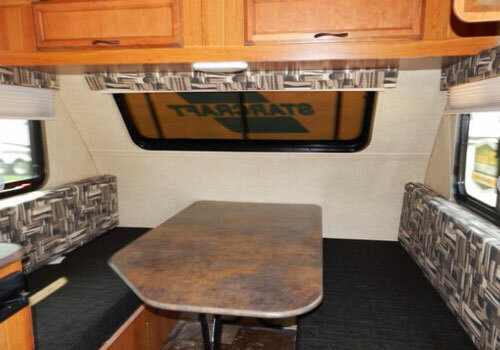 The front dinette next to the extra-large picture window does not invite only for morning coffee or lunch. It can be used for your favorite board games while for nights it converts to comfortable 54” x 80” double bed. The table itself is portable, so easily can be moved outside. It helps to enjoy an “outdoor” environment under the umbrella of 8 ft long camper’s power awning. The overhead cabinets are located throughout the trailer. Together with remaining cabinetry, they all have hardwood doors. The spacious closet next to the entrance door, bins under the bench as well as accessible from outside storage space seem to provide enough of room for “stuff” you would like to carry with you when on an adventure trip. Arched ceiling design not only adds a lot of headroom but also enhances the appearance of trailer’s “living space”. 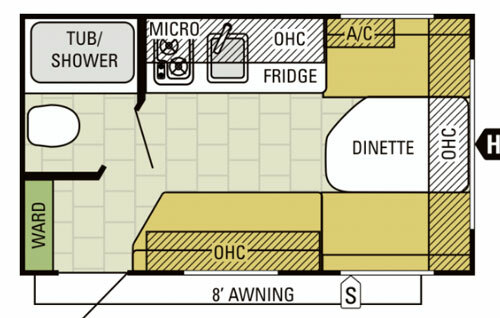 The private, walled wet-bath is now an appreciated standard in small travel trailers. 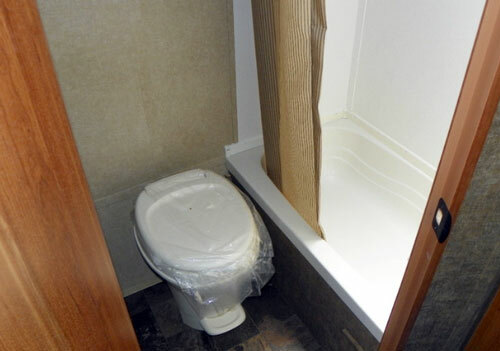 The 14RB offers a foot-flushed toilet, curtain separated shower with tub and ceiling vent as well as mirror. The 6 gallons DSI water-heater w/bypass completes the long list of “necessities” making vacations a memorable experience. And finally the sofa along the side-wall opposite to the galley give you chance not only to rest during a cooking “séance” but also to relax anytime during a day or early morning, especially when the dinette is still serving as a bed. The sofa also converts to an extra sleeping place for one person. It’s worth to note that the optional Climate Package (insulated, heated and enclosed underbelly as well as extra insulated roof) significantly extends the camping season. 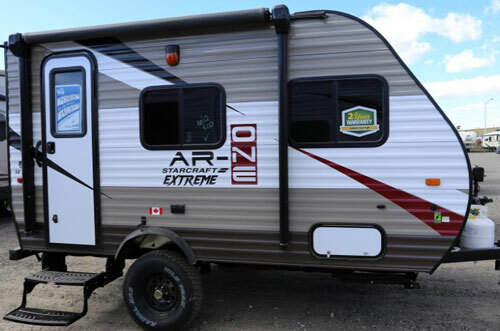 Summarizing – the AR-one 14RB is a durable, value-priced entry-level travel trailer with amenities and features exceeding expectations for this class of campers.